The latest rage in portable media devices these days has been touchscreen with the iPhone and iPod Touch. But with Home Theater PC's typically touchscreen isn't the first thing people think of - its controlling that HTPC with a remote control (the 10-foot interface) that first comes to mind. There are however some times when a touch-screen interface does lend itself to the HTPC. You can use touchscreen for the remote control, for a secondary monitor in a room for controlling and viewing or even as a primary monitor in a kitchen or other room that lends itself to a touchscreen interface instead of or to complement the remote control. Take Sam Greco's touchscreen HTPC for instance. 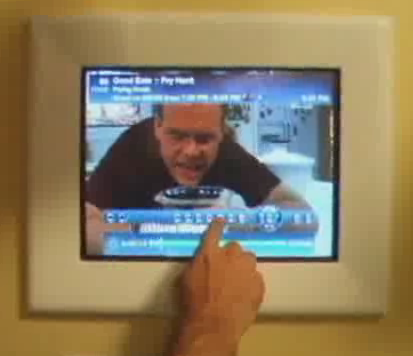 Sam has several SageTV clients in the house, but the kitchen has the prized touchscreen interface. Sam uses an ELO 1543L touchscreen monitor he purchased from eBay. The monitor has a USB connection for the mouse/touch & runs his touchscreen from his server PC in the basement. The screen is mounted in a kitchen wall just above with long USB and VGA cables. The SageMC touchscreen interface was a project developed by Mike, known as MeInMaui on the SageTV forums. Mike also contributes to the SageMC project and developed a mouse-friendly interface for the SageMC UI called SageMC Toolbar. Then ported that project into the touch-screen interface. The SageMC Touchscreen Interface plugin adds a control bar to SageMC intended to provide touchscreen users with the following touchscreen buttons:: Back, Home, Stop Play/Pause, Skip back/fwd, Skip back2/fwd2, Record, Sleep, and Fullscreen. More Info & Download for the SageMC Touchscreen InterfaceYou can find out more about Sam Greco's setup with Premise, SageTV and his touchscreen monitor at his MediaPC Forums site.